While technically a financial success thus far, the DC Extended Universe has been a rocky rollercoaster. People seemed to either love or hate Man of Steel with a passion. Batman v Superman was equally divisive, although even the people that liked the movie admitted it was all over the place. Suicide Squad put a little more emphasis on fun and actually won an Oscar for its makeup effects, but the narrative was still a mess to say the least. Wonder Woman marks the studio’s last chance to win back audiences before the Justice League assembles. The good news is that this superhero movie doesn’t fall into the same traps as its predecessors. Fans will be delighted to hear that Wonder Woman doesn’t get bogged down with sloppy editing, dingy set pieces, and nonstop brooding. It doesn’t overdose on exposition, juggle more characters than it knows what to do with, or foreshadow a dozen future entries in this cinematic universe. Okay, I’ve pretty much gone over everything Wonder Woman isn’t. So what is it then? Well for starters, Patty Jenkins’ film is a stunning blockbuster with remarkable action, compelling themes, and a clear focus. Gal Gadot’s portrayal of Wonder Woman was easily a bright spot in Batman v Superman. Here, she’s given center stage as Diana Prince and boy does she shine. An Amazon princess, Diana has spent her entire life surrounded by strong, resilient women, but doesn’t encounter a man until a US pilot crash lands on her island. Chris Pine is the definition of charming as Steve Trevor, who holds the key to saving countless lives in the midst of World War I. Despite her mother’s apprehension, Diana decides to accompany Steve to London and fight. In her conquest against the Germans, Diana receives aid from Steve’s trusty secretary (Lucy Davis) and an advocate for peace (David Thewlis). To DC’s credit, this franchise has delivered more than a few mind-blowing action sequences. So it’s no surprise that Wonder Woman doesn’t fall short in terms of fight choreography or visuals. You wouldn’t think the filmmakers would ever be able to make the Lasso of Truth look badass, but they miraculously pull it off. What the action here has that the previous film’s lacked is a legitimate sense of dread. You never felt truly invested when Batman and Superman fought each other. Allan Heinberg’s screenplay takes the time to develop its characters, however. So when they march into battle, we care about them just as much as the soldiers in Saving Private Ryan. What’s more, Wonder Woman works in meaningful commentary about human nature, as well as the nature of war. Diana is convinced that Ares, the Greek god of war, is the root of mankind’s corruption. Of course it slowly becomes clear that life is much more complicated than that. As much as we all like to point the finger at one person, there’s usually plenty of blame to go around. Even when humanity is at its worst, though, the world is still worth making sacrifices for. 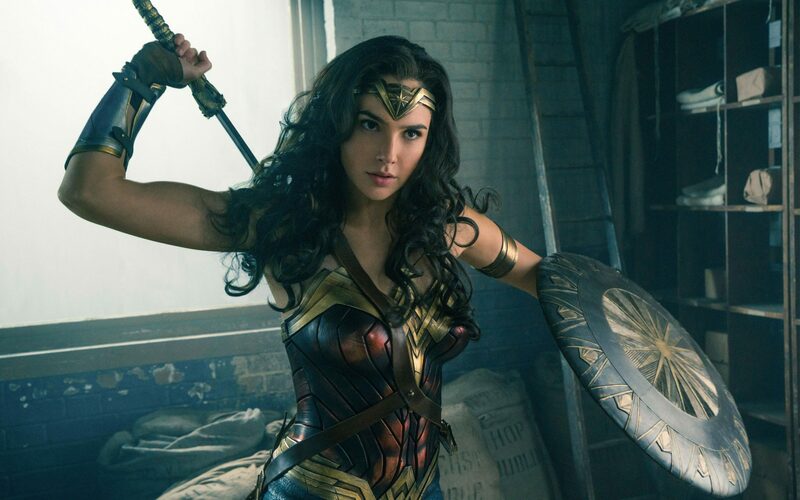 While Wonder Woman is indeed a wonderful film, it’s admittedly not without a few familiar superhero tropes: the death of a mentor, a supportive love interest, and a villain that never fully delivers. It additionally draws a few parallels to Captain America: The First Avenger and Thor. What sets the film apart, however, is its leading lady. Between Catwoman, Elektra, and Tank Girl, Hollywood has continually dropped the ball when it comes to female-led comic book movies. Even the Marvel Cinematic Universe has yet to give Black Widow a standalone picture. This film efficiently does Wonder Woman justice and will hopefully usher in a golden age for superheroines. This entry was posted in Reviews and tagged Action, Adventure, Fantasy on May 31, 2017 by Nick Spake.